Yeah, but: A lot can change in a year. The Long Version: I reviewed the SX20 almost exactly a year ago, and there are a few differences this time around. For one thing, I don't own the SX30, and I never will. 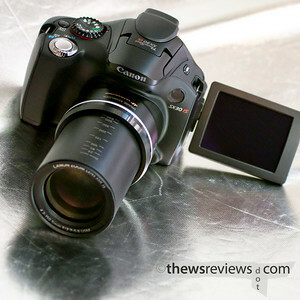 I also don't own the SX20 any more, having sold it after getting the GH1 which is a superzoom done right. Of course, the SX30IS has the spiffy new 35x 24-840mm-e lens with an image-stabilization system that really does work, which will be the reason why people buy it. Maybe the rest won't matter. The other big change from the SX20 is the battery. Gone are the four AA batteries, replaced by the same proprietary rechargeable batteries that are used in the G11/G12. The lens is also lighter, making for a camera with very different handling than the previous models. For most people this will be a good thing, good enough that they'll overlook the memory card moving back into the battery compartment. That's the way most compact cameras work, and even a bad design can benefit from the comfort of familiarity. But man, is this camera ever ugly. The hand grip is awkward, being simultaneously angular and hard to hold. The SX20 had a substantial grip, partly thanks to the jumbo battery compartment, but the SX30 is too small for my hands without the benefit of it being a diminutive camera. While Canon's SLR's have all been borrowing from the swoopy-slabby stealth-fighter aesthetic recently, this long-zoom plastic case looks like an F22 that's crashed into the ocean, been eaten by a shark, and pooped out the far end. The mode dial is dished out in a way that's unique to the SX30, and there's a red detailing to it that adds to its disco points. And just in case you forget what camera you own, the SX30 has added another branding location on top of the flash, facing backwards, so that there's no escaping this camera at all. Someone once said that the best the best thing about driving a Pontiac Aztek is that you can't see the cars' exterior. That gives the automotive horror a real advantage over the Canon, because looking through the SX30IS is actually worse than looking at it. It has a mediocre-average 230K 2.8" LCD screen, and the worst electronic viewfinder I've seen in years. The rise of mirrorless cameras has created a renaissance for electronic viewfinders. People who swore they'd never use an EVF are coming around, and many cameras have genuinely good ones. This one is nowhere near the Panasonic m4/3 options, and is years behind what Sony has on their upcoming "SLT" A55 camera. In the SX30's own long-zoom class, the arch-rival Panasonic's viewfinder is considerably better than the SX30, and even the Nikon Coolpix P100, which is otherwise an uninspiring little machine, does better. Considering how important the EVF is for controlling and aiming long telephoto lenses, this is a huge problem. Adding additional humiliation, 2003-vintage Sony F828 has a visually larger viewfinder, and it even has 30,000 dots - 15% - more resolution than the 2010 Canon camera. It's appalling. I've never said this about anything before, but from an aesthetic and ergonomic point of view, I'd rather have a Sony Alpha A330. 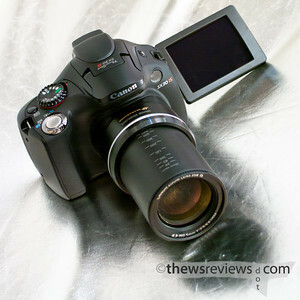 Even people who love Sony don't like that camera - the SX30's viewfinder really is that bad. As far as the performance goes, there's not much to say. 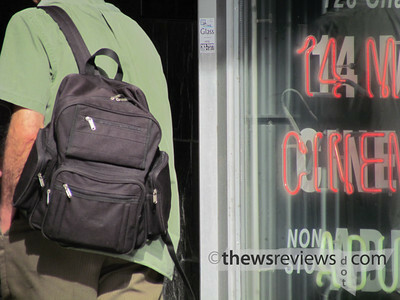 It's a Canon superzoom, so the image quality averages out to a decent but not outstanding result. The big deal is the lens, which is longer than anything else on the market (at the moment). This is something like having a talking dog - it really doesn't matter what it says, its mere existence is remarkable. I can also say that its image stabilization works very well, holding the picture very steady even when at the monstrously long zoom extension. The photo above, of the man with his hand in his pocket as he enters an 'adult entertainment' venue, was taken from the far side of the street and hasn't been cropped at all. The camera handles its primary task as well as anyone could ask, given its intended purpose and market. Those who are able to withstand their first encounter will probably be quite happy with it, or at least grudgingly accept its compromises. But whatever you do, don't even think about buying it without trying it first. In the immortal words of Opus the Penguin: "Okay, maybe it wasn't that bad, but Lord, it wasn't good." Time could prove me wrong. Style is personal, and some say that taste can't be taught. But man, that viewfinder stinks. Well, so much info about the EVF, but you didn't tell what's its size. SX20 had a 0,44" EVF while most superzooms use half that size (but equal resolution). SX20 EVF looked good in the way it was so big, but also coarse, as you could easily see the pixels. In the case of SX30 IS, what to we have, in terms of size? There are no specifications that I've seen online about the size of the EVF on the SX30, only that it's a 205K-dot design, while the specifications for the SX20 specify a 235K-dot 0.44" display. I don't have the ability to measure it directly myself, but subjectively and visually, the SX30 is on the wrong side of petite. Not only does it take up a very small proportion of the field of view, it has a definite "light at the end of the tunnel" that's normally associated with the worst entry-level DSLRs from years ago. It's a significant step back from the SX20, and really needs to be seen to be believed. I can't belive it. I mean, I belive you, but it seems almost impossible to understand why Canon did something like this. They don't even have to put any distance between superzoom segment and larger sensor mirrorless, like Panasonic, because they don't have any. What's the point of a new model with downgraded specs? I was going to buy this camera. Was. I'm astonished now. BTW, I think we are starting to see how this Megapixel crowded small sensors can't deliver sharpness almost under any circumstances. The pixels are there, the sharpness is not. I thought technology would improve on small sensors but it seems not to be the case. What brings me to the next question. As you said you own a GH-1, what's your take on the rolling effect issue on this model, when filming with a long lens, handheld? I've seen the new 100-300 mm and it looks promising but for wildlife, tracking subjects handleld... you know. Thanks again if you have time to answer. There's a lot of people that appreciate an "authorised" opinion. Ray. Ray, I actually can't comment on the GH1's video performance, as I've never really used it. I've put both the SX20 and GH1 through some sequences, but never recorded any significant time or movement. But after one experience with the scrambled nothings of the AVCHD footage, I just started using Final Cut Express to pull sequences directly from the memory card. To be clear, the image quality of the SX30 is adequate, the lens range is tremendous, and the image stabilization at such a huge magnification is among the very best I've seen. It will make some people very happy. But the viewfinder is the smallest I've seen in ages, visibly worse than the FZ40, P100, and the eighteen-month-old Sony HX1: it's a big step back from the SX20. I've tried two different cameras just to make sure, and both have looked small, dim, murky, and slightly green. A year ago I had to decide between the Panasonic FZ35 and the SX20, and despite already having an IR-converted FZ18, I went with the Canon. If I was trying to decide between the current batch of compacts, my choice would be between the FZ40 and FZ100. The SX20 wouldn't come into my consideration at all, which is too bad. Am I the only one that noticed the awesome L Series Dial? One thing I can say. A "big" CMOS sensor is not a good combination when it comes to manage rolling shutter effect. I have seen videos taken with GH-1 with a long lens and handheld and the effect makes the footage unusable. So, for "superzoomer videographers" SX30, with its CCD might turn out to be quite good. Ray. When I purchased my SX10, the SX20 that has HD movie recording was released only a month after I purchased the SX-10. I patiently waited for the next model to see what improvements they made and the 35X zoom with 720p HD movie recording is very impressive. Unfortunately, I did not look at an SX30 before I ordered one online. I knew it has a proprietary battery, but even though I prefer to use rechargable AA cells I ordered one. After much anticipation to receive it, I happily removed it from the box. Then I saw the bad points. The grip is small, has a poor shape and is not rubberized like on the SX10. The grip feels like cheap plastic and has a very fine dotted texture that will wear away in no time making it slippery. The small, non-rubberized grip makes the camera very difficult to hold securely. I first looked into its EVF in disbelief because it is about 1/4 of the size of the SX10's. The SX30 does not come with a lens hood, which is now a $25 accessory. (Really, Canon, it's molded plastic! Why was it omitted?) A lens hood was included with the SX10. Because of the proprietary battery, the small slippery grip and the tiny electronic viewfinder, I am so unhappy with the SX30 camera that I am returning it even though it has an amazing 35X optical zoom and HD recording. For me, its cons outweigh the pros.